When Sally Wang’s mother was diagnosed with breast cancer a few years back, she struggled to figure out how to get her the best medical help available. Even with assistance from others, including a federal judge she clerked for, it was still a challenge for the 34-year-old who spent a career in the healthcare field. “So that got me really thinking about if that was this difficult for me, what would it be like for other people who are not medically inclined and don’t have the training in the field and don’t have the connections,” Wang told NBC News. That experience led Wang, a Harvard graduate with a joint law degree and master’s of public health, to co-found a company in 2015 called DocFlight, for which she serves as CEO. “Generally in almost all the cases, our physicians have recommended a change, at least a tweak, in the course of therapy." Wang’s startup counts itself among the firms based in the United States that deal in the domain of telemedicine, sometimes called telehealth, which uses technology to remotely connect doctors and patients otherwise separated by physical distance. Globally, it’s a burgeoning area of medicine forecast to grow even bigger. Estimates on telemedicine’s market size vary according to research firms that study it. Market Data Forecast, one such research company, projects it will more than double from $25.53 billion in 2015 to $57.92 billion in 2020. 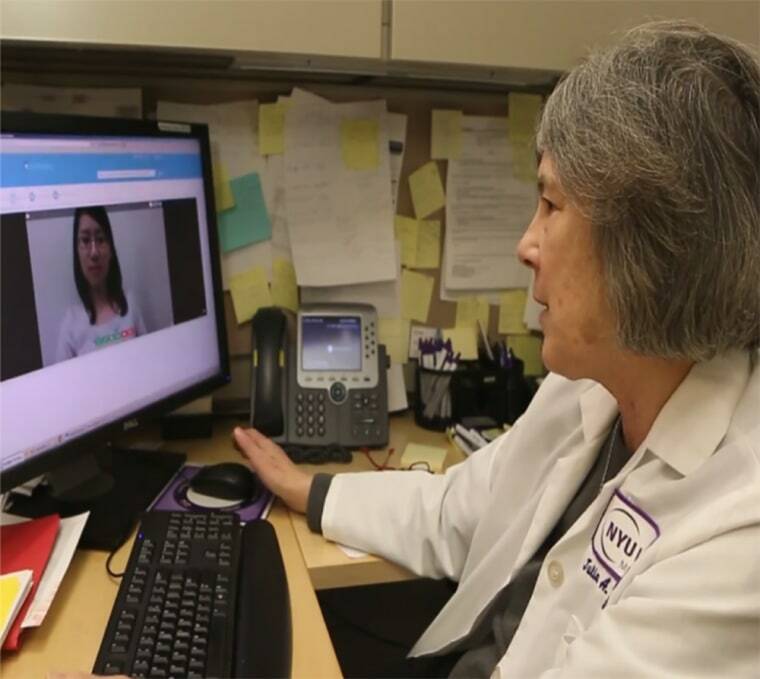 In the U.S., telemedicine has become increasingly popular with patients and doctors. Someone sick in a rural area far away from a hospital, for instance, can still receive care through a virtual visit with a physician. Others with illnesses like colds or the flu can do the same without leaving home, all for less than it might cost for a physical visit. But DocFlight is different, Wang said, in that it focuses on patients thousands of miles away in China. “It’s also hard to access the best doctors in China. It takes a lot of connections,” she added. With a population close to 1.4 billion, China has been grappling with an ailing healthcare system that the government is trying to reform. Without changes to China’s healthcare system, the joint report projects that health spending there will increase from roughly $3.5 trillion yuan (US$520.9 billion) in 2014 to $15.8 trillion yuan (US$2.35 trillion) in 2035. But for a couple of thousand U.S. dollars, DocFlight affords patients in China access to its network of several hundred physicians in the U.S. from top-flight hospitals, according to Wang. That includes Dana-Farber Cancer Institute and NYU Langone Medical Center, among others. The virtual visit, which Wang likened to a health consultation, typically works like this: DocFlight learns about the patient’s condition through an intake system, then makes a match with an appropriate specialist. Medical records are translated first by computer, then reviewed for accuracy by a human, according to Wang. At a scheduled time, the patient in China comes online; DocFlight has its own translator, staff, and doctor in the U.S. on the other end of the video platform, while a licensed physician in China can also participate. After any follow-up questions about the patient, findings and recommendations are summarized by the U.S.-based physician, according to Wang. The consultation usually takes around 45 minutes. “Generally in almost all the cases, our physicians have recommended a change, at least a tweak, in the course of therapy,” she said. For one middle-aged woman in China who recently used DocFlight, the visit ended up making a world of difference, according to Wang. Diagnosed with infectious pneumonia, the patient was on a respirator at home in China, and her condition was not improving, Wang said. Her family, seeking a second opinion, reached out through a friend to Wang a few months back. DocFlight matched the woman with a top pulmonologist in New York, who agreed to see her through an online video consultation. An evaluation of her CT scan, a kind of specialized X-ray, and medical records translated into English revealed something startling, Wang said — she had been misdiagnosed in China. A couple of weeks after her DocFlight consultation, the woman was better and remains healthy, Wang said. Telemedicine is not without its critics. Some point to the limitations of doctors unable to physically examine a patient through a video screen. Others worry about misdiagnoses and how they’re handled. For DocFlight, Wang said its doctors don’t write prescriptions, nor do they provide treatments or perform procedures. The company does still protect its physicians with malpractice insurance, Wang noted. The American Medical Association last June adopted new ethical guidance on telemedicine in an effort to help physicians understand how their responsibilities to patients “may play out differently” than under a traditional setting at a hospital or doctor’s office. "The new AMA ethical guidance notes that while new technologies and new models of care will continue to emerge, physicians' fundamental ethical responsibilities do not change," board member Dr. Jack Resneck said in a news release at the time. While companies like DocFlight open up top medical experts in the U.S. to patients in China, some worry that such services benefit only the affluent, thus widening China’s healthcare inequality gap. Nearly 40 percent of China’s population fell into the low-income category, meaning their disposable income amounted to $2,100 per year, CNBC reported in November, citing a report from the Economist Intelligence Unit. But the same analysis also showed that China, based on income measures, is poised to become a middle-class society by 2030. “We can’t say that we can help everybody, but we can certainly at least serve those in the middle class, which is the vast majority of the Chinese population,” Wang explained. In the meantime, one way DocFlight is trying to aid those in China unable to afford its services is by offering patient guides online for free, which Wang said the company is in the process of publishing. That literature, she said, translates English-language articles, papers and publications about the latest in medicine and gold-standard treatments in the U.S. into Chinese. Still, Wang believes DocFlight presents a more affordable option to Chinese patients than so-called medical tourism, in which the wealthy travel overseas for expensive medical treatment, often spending upwards of tens of thousands of dollars out of pocket. DocFlight also arranges such trips to the U.S. for Chinese patients seeking medical treatment, though Wang added that they also have the option of being treated back home in China. The good news, Wang said, is that China invests in state-of-the-art equipment to run medical tests, a key to making accurate diagnoses. But the country’s healthcare system still incentivizes dispensing drugs and performing medical procedures over good patient health outcomes, a model that China is trying to reform, according to the joint report. Costs for unnecessary treatments ordered by doctors can thus mount up fast. “We can’t say that we can help everybody, but we can certainly at least serve those in the middle class, which is the vast majority of the Chinese population." Since its founding two years ago, DocFlight has had a few dozen patients, usually seeing those with chronic diseases or cancer, according to Wang. She said DocFlight is trying to expand its patient base by working with referral sources in China. Those groups, Wang said, can reach about 10 million patients. It’s also collaborating with Chinese hospitals, according to Wang, including one in Shanghai that specializes in dermatology, a branch of medicine that lends itself well to telemedicine visits. Beyond China, Wang said she sees DocFlight possibly expanding to other countries where gaps are present in medicine and healthcare.